For the final event of the Second Arya Kshema Winter Dharma Gathering, the Tergar shrine hall has been set up with tables for the defenders, set across the center aisle in front of the Karmapa’s throne, and with a microphone for the challengers who will stand two thirds of the way back towards the shrine door. This is to keep the challengers, who can get quite enthusiastic as a group, at a certain distance from the defenders. The young Druppön Dechen Rinpoche sits at the head of the first row of teachers and khenpos. In a previous lifetime, when he was the guide for the Karmapa’s seat at Tsurphu in Tibet, Druppön Dechen Rinpoche was very kind to a group of nuns who had no home. He generously gave them teachings and also a place to stay at Tsurphu; several of them came to live in the famous caves of the previous Karmapas, located on the middle circumambulation path. His tulku seems to be continuing his support of nuns in this next life, too. This evening is the culmination of the daily debating that has happened since the nuns arrived. The three responders (those sitting on the ground) are nuns from Tara Abby (Thrangu Rinpoche), Karma Drubdey (Khenpo Tsultrim Gyamtso), and Samten Ling (Gyalpo Rinpoche). 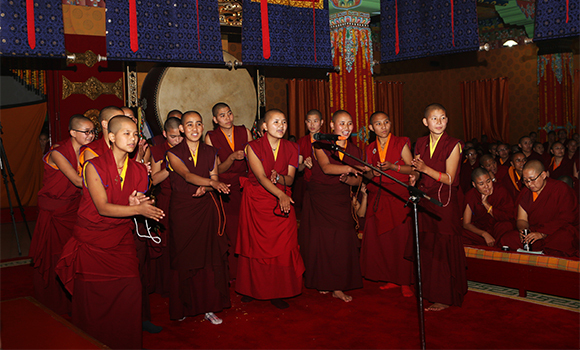 The challengers, who number up to sixteen, are from Tilokpur Nunnery (the Gyalwang Karmapa), Dongyu Gatsal Ling (Jetsunma Tenzin Palmo), and Ralang Nunnery (H.E. Gyaltsap Rinpoche). To begin, at the back of the central aisle, the three nuns place their yellow cockade hats curved like crescent moons on the red carpet in front of them. After three bows, they walk up the aisle to offer a kata to the Karmapa’s table and then take their seats facing the challengers. As usual, the first challenger begins with a dialogue that establishes the definitions of the terms, in this initial case, it is the category of relationship, which actually deals with cause and effect. After the nuns have been debating for a while, one of the khenpos on the side joins in the animated exchange to challenge the defending nun and then another teacher adds his voice. She, however, remains unflappable, responding to them both with aplomb and a smile. The debate moves through the classic territory of the reasoning on being one or many—the key analytical tool used in Chandrakirti’s Entering the Middle Way. “Do phenomena have a single essence or not?” “Is the essential nature of permanence and impermanence the same or separate?” “If it’s the same, then give me an example of something that is both impermanent and permanent!” And when the answer was slow in coming, the challenging nuns took up a chorus of Chir! Chir! Chir! Give your reason! The debate was energetic and, just as the monks do, one nun wraps her zen (stole) around her waist (the equivalent of rolling up your sleeves) and leans into her hand claps that punctuate her statements. A round of enthusiastic applause greets the end of the debate. The next group of defenders comes forth, bows, and walks down the aisle to offer their katas to the Karmapa, who keeps them as a special sign of an auspicious connection. The topic now is universals and particulars. The nuns again start the discussion with definitions and then move into the substance of the debate: “If it’s a thing, it follows that it’s not a universal.” Again the debate is lively and the nuns again demonstrate that they are at home in this new form they have only been studying for two years. At the end, a single nun comes forth to close the debate. She mentions that Dharma is essential for happiness and joy, and that the benefit of debate is that it can help lead us all the way to the level of Buddhahood. After a break, the Karmapa speaks, first showing a beautiful new logo for the Arya Kshema gathering. It shows three nuns, their curving robes shaped like individual lotus petals; underneath on the right and left are quick, pointed strokes indicating the leaves and grounding the image. After welcoming everyone, the Karmapa notes that there were many different activities and they all went well because people were working harmoniously together. We should all take joy in the fact that we could be here. The Karmapa also praises the nuns saying that this is only the second gathering of the nuns and the monks had gathered eighteen times; however, the nuns had improved at a much faster rate than the monks. All the nuns should rejoice in this and the Karmapa offered his thanks as well.